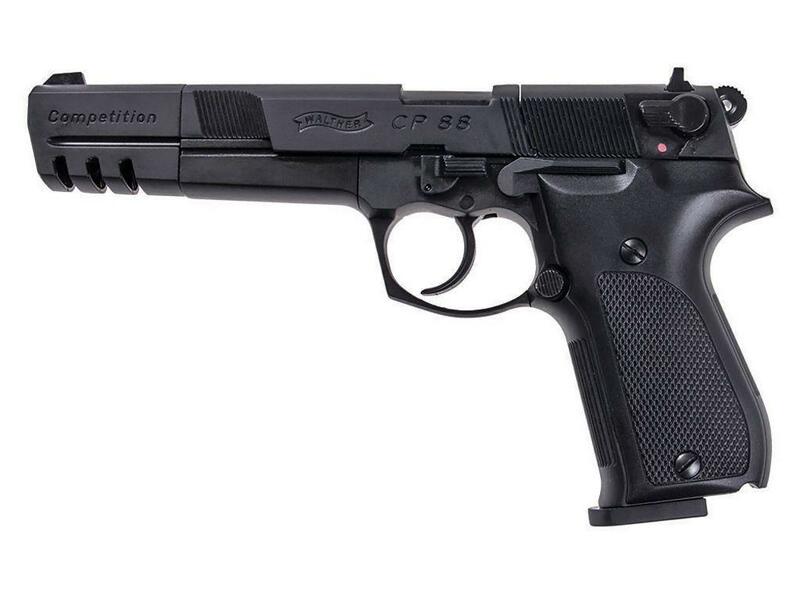 Walther CP88 Competition Pellet Pistol | ReplicaAirguns.ca | New Website! 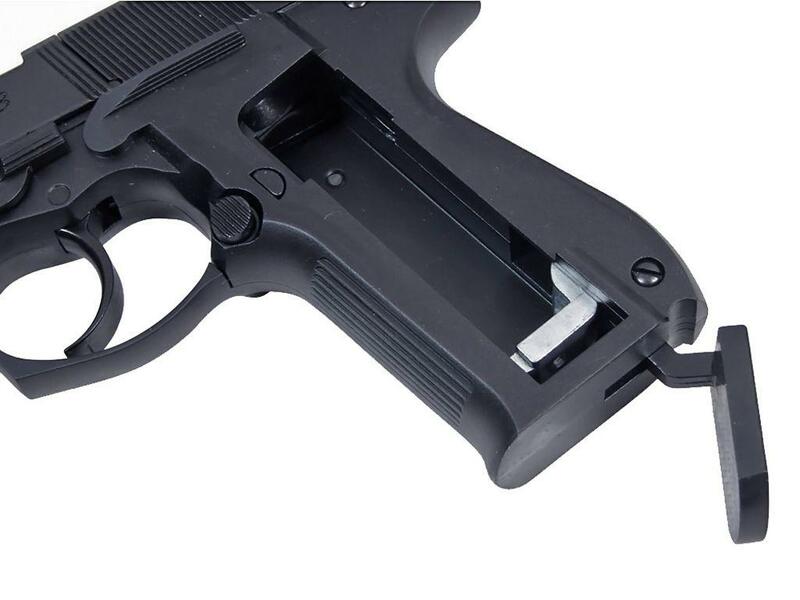 Trigger Pull: The trigger pull on the Umarex Walther CP88 Competition is extremely nice in both single and double action mode with the single action having the lightest and shortest pull, making it really easy to shoot on target with accuracy. Accuracy: Previously using my Standard CP88 (non-competition version), I shot this air gun at a target from 20 feet away in a free standing position, and it performed very well getting about a two inch grouping close to the center of the target and staying in the two inch sweet spot even with 3 magazines or 24 rounds shot, I shot just a little bit high and to the right. The good news is the sights can be adjusted for windage if you are shooting a tad bit to the left or right. My Chrony testing with an eight shot averaged result was 360 fps using 6.9 grain RWS pellets. I will be conducting a new Field Test Shooting review using my CP88 Competition version versus the shorter barreled version to see how they both perform in the exact same test environment. Build Quality: This is an almost all metal air gun with great fit and finish and a nice dense 2.56 pound weight to it. It's made in Germany, so you know it's made right? The only plastic parts to speak of are the grips which are a hard matte black plastic which matches the rest of the airgun nicely. All the mechanical parts operation are as smooth as butter. Realism: The Umarex Walther CP88 Competition is a licensed replica of the real Walther P88 semi auto pistol. It looks very close to the real steel with the exception of the break in the slide where the rotary magazine is accessible and the extra "C" in the name. May be too heavy for some shooters? Comments:I have to say I pretty much like mostly everything about this airgun. Its size, its looks, its German build and quality and the way it shoots. The Umarex Walther CP88 Competition air pistol is one of those airguns I think everyone should save up for just to have the pleasure to own and shoot. It may not have blowback or a full size drop out magazine like some of the other newer styled flashier air pistols but I can tell you it is a real joy to shoot. When you hold it in your hand and point it at the target, all you can think about is how much fun you are having with this quality air gun that is sure to give you many years of enjoyment! This all steel German made pistol has amazing workmanship. I have owned my CP88 for over a year now and have shot over 8000 pellets with it up to this day. The FPS average is the same today as it was out of the box (-5 FPS). The pistol has been flawless in every way and I think it will be in my collection for a very long time ( okay it’s my favourite). I shoot RWS Meisterkugeln .177 Cal Wadcutter for pistols and I get amazing accuracy with these pellets. I didn’t like the sights on the Walther, I found them too wide, so I bought a 4x32 scope and now I get the full potential of the gun. I have it sighted in for 15m and I get a 1.5” grouping with my Meisterkugeln dream pellets. The only 2 negative things for me are: The sights are not adjustable for elevation (no problem with a scope). The trigger is not a two-stage adjustable trigger. I find the trigger pull in double action a bit to long, but it’s very smooth. 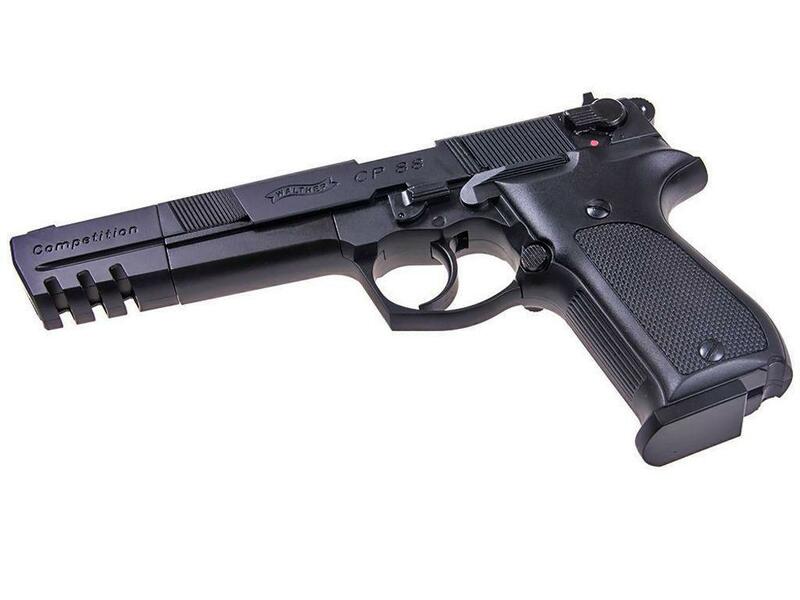 It’s worth saving your money to buy one of these German made pistols. You will not be disappointed and will have it for a lifetime. It handles well and works flawlessly. Great grouping, but use RWS pellets. Bought some daisy pellets and they do not work well with the Walther rotation 8 hole mags. If you want top accuracy in a pellet gun, this is the one. I fired the CP88 Competition on paper targets at a range of approximately 25 feet (indoors: as it's too cold outside ;-)) with various types of pellets. It is very powerful and precise, and I'm confident that it would perform well at distances of 30-40 feet without a problem. Two thumbs up! Excellent pistolet! J'adore. La précision est surprenante et le poids fait que l'on a pas l'impression d'avoir un jouet entre les mains. 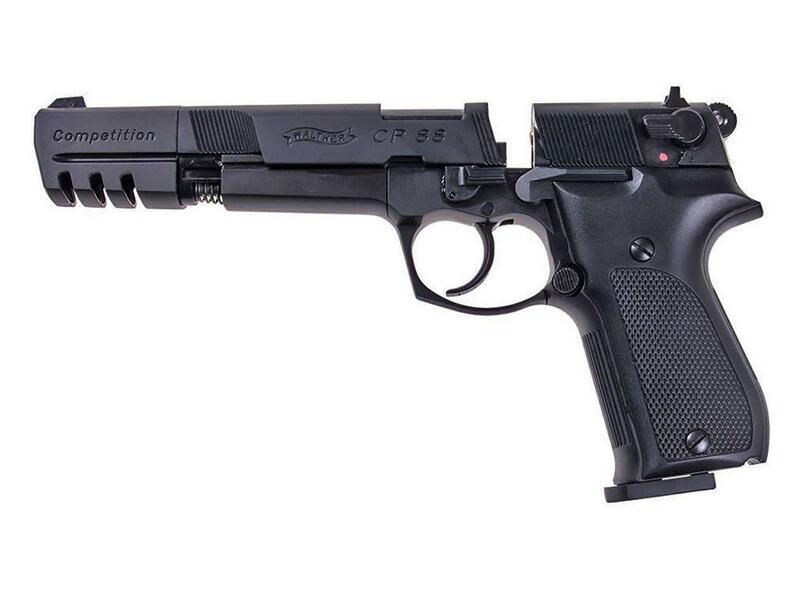 http://www.ReplicaAirguns.com - Walther CP88 Competition CO2 .177 Caliber Pellet Pistol Field Test Shooting Review. Here is my follow up Shooting Field Test to my Umarex CP88 Competition Table Top Review. During this Field Test Shooting video review I not only shoot my CP88 Competition version but I also compare it to the non Competition CP88 version to see if fps and accuracy are effected when adding the longer barrel? I shoot 5 rounds through my Chronograph with both guns to get an average fps and I also step back 30 feet and setup resting my hands on a sand bag and standing in the back for a fairly secure shooting stance. Since the Umarex CP88's have an 8 shot rotary magazine I went with an 8 shot grouping for my accuracy test from 30 feet. Overall both guns performed similarly and as expected the longer barrel CP88 Competition had the higher fps with 424 average versus 347 average, but what was surprising was how much faster the CP88 Competiton shot. Right around 80 fps more which is significant considering there is only 2 inches more of added barrel length to the Umarex CP88 Competition version. I am thinking that perhaps my CP88 Competition test model was tuned a bit better at the factory? When it came to accuracy, both guns performed about the same getting about 1 inch group from 30 feet back. This was not a surprise since barrel length has less effect on accuracy than most people think. Both guns are a pleasure to shoot and will not only perform great shooting close up but if you go with the higher fps Umarex CP88 Competition you will be able to shoot much further out because of the rifled barrel and decent fps performance. 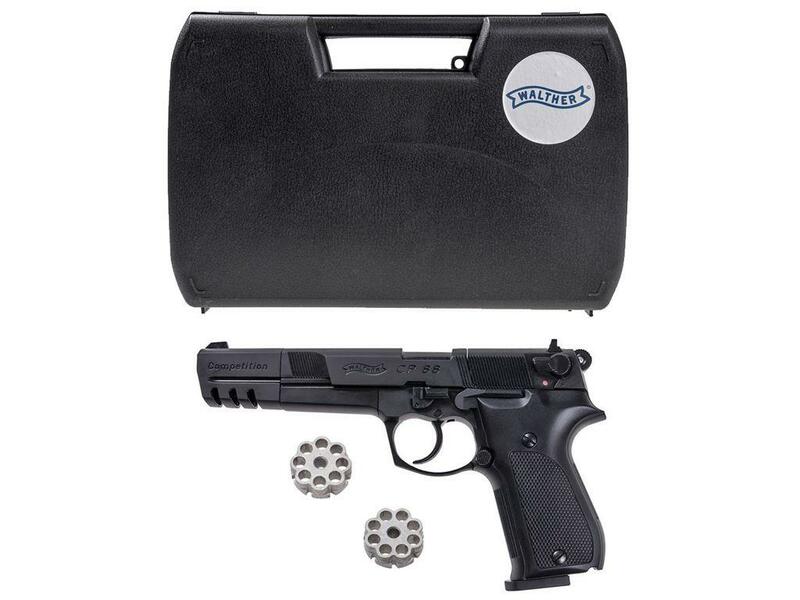 http://www.ReplicaAirguns.com - Walther CP88 Competition CO2 .177 Caliber Pellet Pistol Table Top Review. 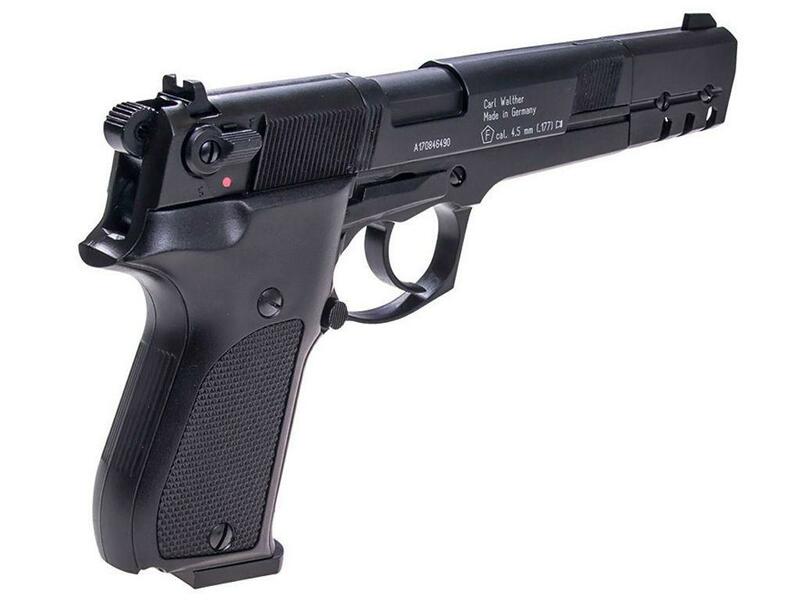 This is a table top review of the Umarex Walther CP88 (Competition Version) CO2 .177 caliber pellet pistol in the Matte Black finished version. I show you around the gun and walk you through its basic operation and handling.The Umarex Walther CP88 is almost all metal and very dense at 2.25 pounds. It is extremely well made. I have to say I pretty much like mostly everything about this airgun. Its size, its looks, it's German build and quality and the way it shoots. The Umarex Walther CP88 Competition air pistol is one of those airguns I think everyone should save up for just to have the pleasure to own and shoot. It may not have blowback or a full size drop out magazine like some of the other newer styled flashier air pistols but I can tell you it is a real joy to shoot. When you hold it in your hand and point it at the target, all you can think about is how much fun you are having with this quality air gun that is sure to give you many years of enjoyment!